"There is nothing else in the world that has the design features I was looking for and the versatility of the mountain trike." I have always been an adventurous person. I broke my back dirt biking one year ago and i honestly thought my adventurous days of exploring trails and being in the outdoors were over. I discovered the mountain trike while researching off road wheelchairs while in hospital and rehab. There is nothing else in the world that has the design features i was looking for and the versatility of the mountain trike. 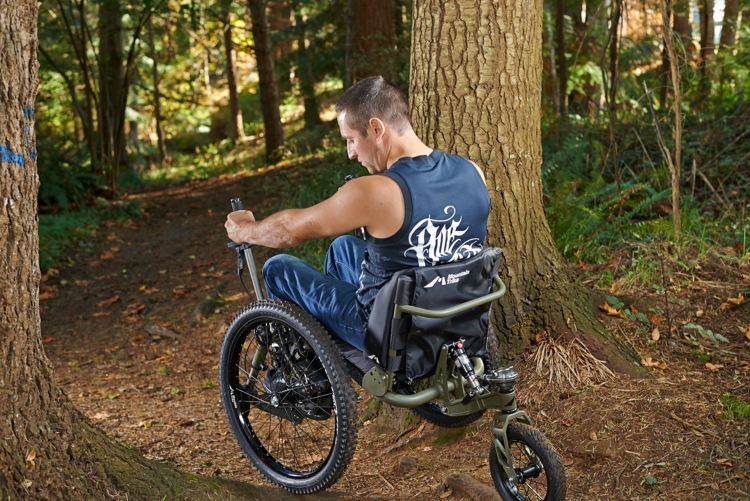 We live in British Columbia Canada on Vancouver Island, there is so many trails and scenic locations that a regular wheelchair could not get to, since my trike has arrived me and my family are able to go out and explore the wilderness together. My fitness has improved greatly since I've been using my trike, it exercises a whole different group of muscles compared to pushing a standard wheelchair. My chest and shoulders have strengthened a lot and i have only had my trike for a few months, i also have to mention it is a lot of fun, while in the tight trails i get small doses of the adrenaline rush i used to be so addicted too.